Abstract A spatially-explicit model (Hydro-MEM model) that couples astronomic tides and Spartina alterniflora dynamics was developed to examine the effects of sea-level rise on salt marsh productivity in northeast Florida. The hydrodynamic component of the model simulates the hydroperiod of the marsh surface driven by astronomic tides and the marsh platform topography, and demonstrates biophysical feedback that non- uniformly modifies marsh platform accretion, plant biomass, and water levels across the estuarine landscape, forming a complex geometry. The marsh platform accretes organic and inorganic matter depending on the sediment load and biomass density which are simulated by the ecological-marsh component (MEM) of the model and are functions of the hydroperiod. Two sea-level rise projections for the year 2050 were simulated: 11 cm (low) and 48 cm (high). Overall biomass density increased under the low sea-level rise scenario by 54% and declined under the high sea-level rise scenario by 21%. 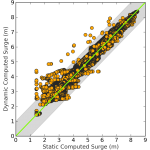 The biomassdriven topographic and bottom friction parameter updates were assessed by demonstrating numerical convergence (the state where the difference between biomass densities for two different coupling time steps approaches a small number). The maximum coupling time steps for low and high sea-level rise cases were calculated to be 10 and 5 years, respectively. 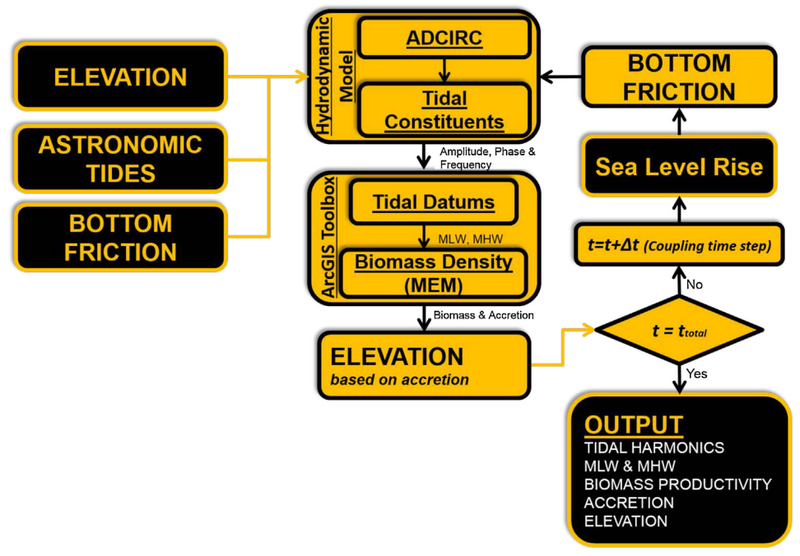 A comparison of the Hydro-MEM model with a parametric marsh equilibrium model (MEM) indicates improvement in terms of spatial pattern of biomass distribution due to the coupling and dynamic sea-level rise approaches. This integrated Hydro-MEM model provides an innovative method by which to assess the complex spatial dynamics of salt marsh grasses and predict the impacts of possible future sea level conditions. M.V. Bilskie, S.C. Hagen, D.L. Passeri, K. Alizad, S.C. Medeiros, J.L. Irish, H. Needham, and A. Cox, “A dynamic flood inundation model framework to assess coastal flood risk in a changing climate.” 2015 AGU Fall Meeting, San Francisco, CA, Dec. 14-18, 2015. Abstract: Coastal regions around the world are susceptible to a variety of natural disasters causing extreme inundation. It is anticipated that the vulnerability of coastal cities will increase due to the effects of climate change, and in particular sea level rise (SLR). 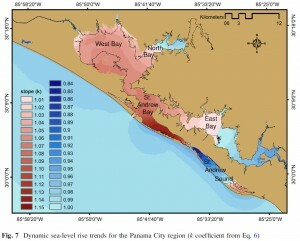 A novel framework was developed to generate a suite of physics-based storm surge models that include projections of coastal floodplain dynamics under climate change scenarios: shoreline erosion/accretion, dune morphology, salt marsh migration, and population dynamics [Bilskie et al., 2014; Passeri et al., 2014; Passeri et al., 2015]. 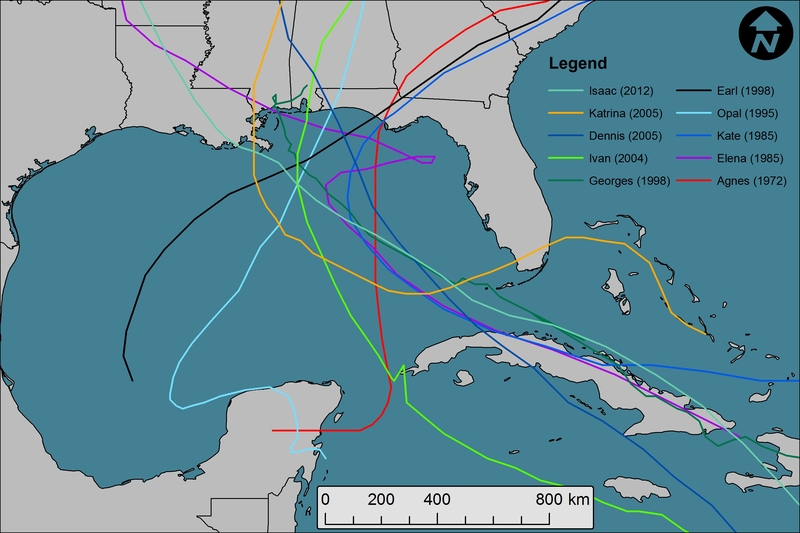 First, the storm surge inundation model was extensively validated for present day conditions with respect to astronomic tides and hindcasts of Hurricane Ivan (2004), Dennis (2005), Katrina (2005), and Isaac (2012). The model was then modified to characterize the future outlook of the landscape for four climate change scenarios for the year 2100 (B1, B2, A1B, and A2), and each climate change scenario was linked to a sea level rise of 0.2 m, 0.5 m, 1.2 m, and 2.0 m [Parris et al., 2012]. 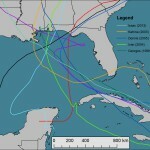 The adapted model was then used to simulate hurricane storm surge conditions for each climate scenario using a variety of tropical cyclones as the forcing mechanism. The collection of results shows the intensification of inundation area and the vulnerability of the coast to potential future climate conditions. The methodology developed herein to assess coastal flooding under climate change can be performed across any coastal region worldwide, and results provide awareness of regions vulnerable to extreme flooding in the future. Bilskie, M. V., S. C. Hagen, S. C. Medeiros, and D. L. Passeri (2014), Dynamics of sea level rise and coastal flooding on a changing landscape, Geophysical Research Letters, 41(3), 927-934. Parris, A., et al. 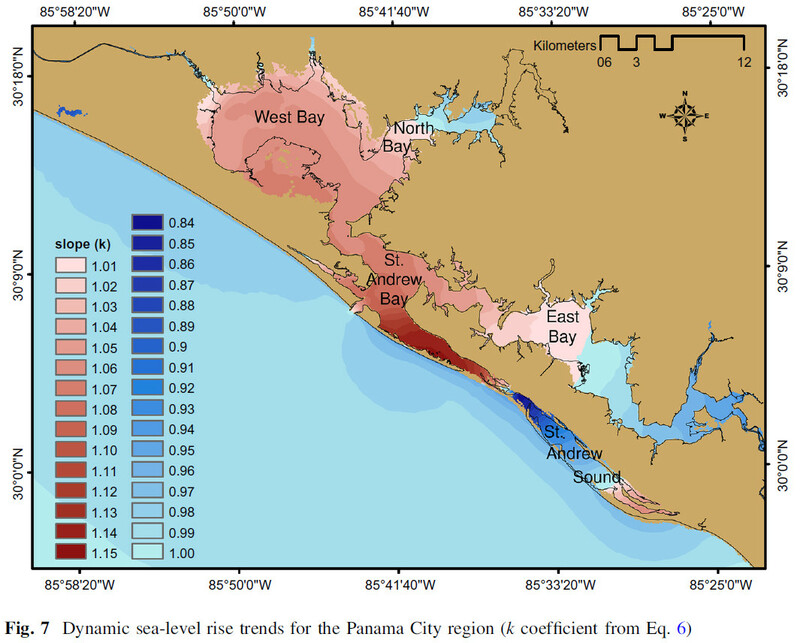 (2012), Global Sea Level Rise Scenarios for the United States National Climate AssessmentRep., 37 pp. Passeri, D. L., S. C. Hagen, M. V. Bilskie, and S. C. Medeiros (2014), On the significance of incorporating shoreline changes for evaluating coastal hydrodynamics under sea level rise scenarios, Natural Hazards, 1599-1617. Passeri, D. L., S. C. Hagen, S. C. Medeiros, M. V. Bilskie, K. Alizad, and D. Wang (2015), The dynamic effects of sea level rise on low gradient coastal landscapes: a review, Earth’s Future, 3. 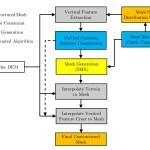 Abstract: A semi-automated vertical feature terrain extraction algorithm is described and applied to a two-dimensional, depth-integrated, shallow water equation inundation model. The extracted features describe what are commonly sub-mesh scale elevation details (ridge and valleys), which may be ignored in standard practice because adequate mesh resolution cannot be afforded. The extraction algorithm is semi-automated, requires minimal human intervention, and is reproducible. 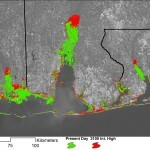 A lidar-derived Digital Elevation Model (DEM) of coastal Mississippi and Alabama serves as the source data for the vertical feature extraction. 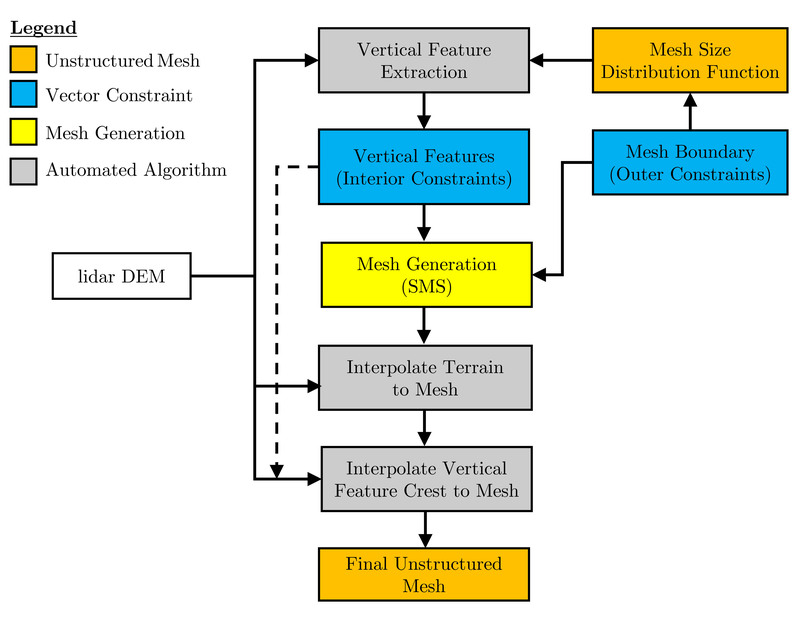 Unstructured mesh nodes and element edges are aligned to the vertical features and an interpolation algorithm aimed at minimizing topographic elevation error assigns elevations to mesh nodes via the DEM. The end result is a mesh that accurately represents the bare earth surface as derived from lidar with element resolution in the floodplain ranging from 15 m to 200 m. To examine the influence of the inclusion of vertical features on overland flooding, two additional meshes were developed, one without crest elevations of the features and another with vertical features withheld. 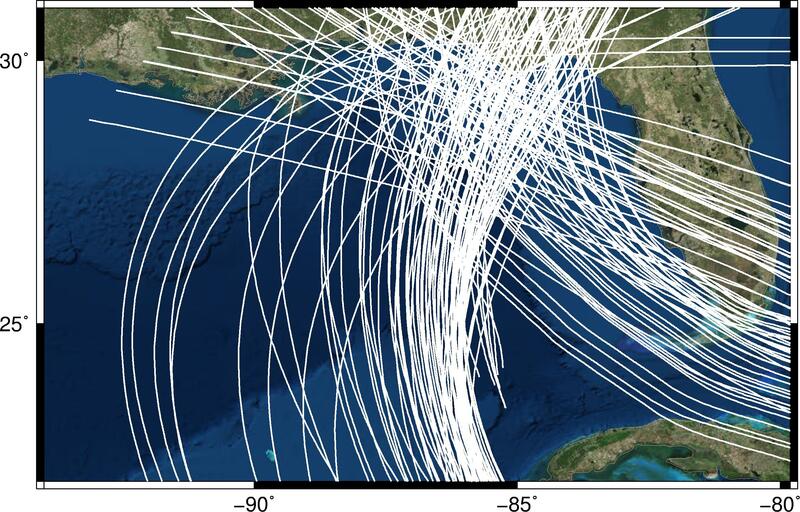 All three meshes were incorporated into a SWAN+ADCIRC model simulation of Hurricane Katrina. Each of the three models resulted in similar validation statistics when compared to observed time-series water levels at gages and post-storm collected high water marks. Simulated water level peaks yielded an R2 of 0.97 and upper and lower 95% confidence interval of ∼ ± 0.60 m. From the validation at the gages and HWM locations, it was not clear which of the three model experiments performed best in terms of accuracy. Examination of inundation extent among the three model results were compared to debris lines derived from NOAA post-event aerial imagery, and the mesh including vertical features showed higher accuracy. The comparison of model results to debris lines demonstrates that additional validation techniques are necessary for state-of-the-art flood inundation models. 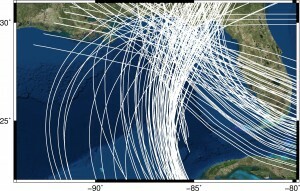 In addition, the semi-automated, unstructured mesh generation process presented herein increases the overall accuracy of simulated storm surge across the floodplain without reliance on hand digitization or sacrificing computational cost. Abstract: Coastal responses to sea level rise (SLR) include inundation of wetlands, increased shoreline erosion, and increased flooding during storm events. Hydrodynamic parameters such as tidal ranges, tidal prisms, tidal asymmetries, increased flooding depths and inundation extents during storm events respond non-additively to SLR. Coastal morphology continually adapts towards equilibrium as sea levels rise, inducing changes in the landscape. Marshes may struggle to keep pace with SLR and rely on sediment accumulation and the availability of suitable uplands for migration. Whether hydrodynamic, morphologic or ecologic, the impacts of SLR are interrelated. To plan for changes under future sea levels, coastal managers need information and data regarding the potential effects of SLR to make informed decisions for managing human and natural communities. This review examines previous studies that have accounted for the dynamic, nonlinear responses of hydrodynamics, coastal morphology and marsh ecology to SLR by implementing more complex approaches rather than the simplistic “bathtub” approach. These studies provide an improved understanding of the dynamic effects of SLR on coastal environments and contribute to an overall paradigm shift in how coastal scientists and engineers approach modeling the effects of SLR, transitioning away from implementing the “bathtub” approach. However, it is recommended that future studies implement a synergetic approach that integrates the dynamic interactions between physical and ecological environments to better predict the impacts of SLR on coastal systems. these SLR adjustments are shown to be reasonable for surge hazard assessments.